The largest cavalry battle of the American Civil War took place at Brandy Station, Virginia, where J.E.B. Stuart's Confederates and Alfred Pleasonton's Federals clashed, swords flashing and pistols blazing. Major Henry B. McClellan should have had a quiet afternoon. At dawn on June 9, 1863, Union cavalry had launched a surprise attack on Maj. Gen. James Ewell Brown Stuart’s forces near Brandy Station, Virginia. Untroubled, the Confederate leader led his men out of camp to deal with the threat, assigning McClellan to remain at their headquarters on Fleetwood Hill. As the recently appointed assistant adjutant general of Stuart’s force, McClellan expected to have little more to do than coordinate and relay reports from mounted couriers. All hope for anything like a routine day vanished when McClellan turned to see several thousand Federal horsemen bearing down on Fleetwood Hill. “Cavalry Duel at Brandy Station” by David A. Norris chronicles the fierce fighting that took place soon after. Pleasonton launched his surprise attack on Stuart’s cavalry, and after an all-day fight in which the initiative constantly shifted between the Union and Confederate army, the Federals eventually retired. But who won the battle? At the time, most Confederates agreed with the article posted in the Richmond Examiner that the conflict at Brandy Station was “a victory over which few will exult.” But as far as the North was concerned, Brandy Station was a big cause to celebrate: for the first time, Union cavalrymen were able to hold their own against their Confederate counterparts. After you read about the full aftermath, you’ll be able to decide for yourself. In the forbidding countryside of Virginia’s Wilderness, Ulysses S. Grant and Robert E. Lee stumbled blindly toward their first wartime encounter. Each intended to do what he did best—attack. What do you think of the outcome at Brandy Station? Was it as the Confederates claimed? 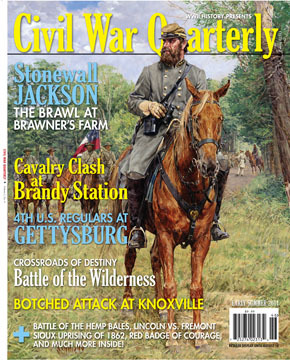 Let us know what you think about this and other features in this issue of Civil War Quarterly in our comments section. Tags Abraham Lincoln, Alfred Pleasonton, Ambrose Burnside, American, american civil war, Battle of Gettysburg, cavalry, Chattanooga, Chickamauga, CIA, civil war, civil war cavalry, Civil War Quarterly, Confederate, Confederate Army, confederate leader, confederates, Emancipation Proclamation, Features, Fleetwood Hill, general, general james longstreet, German, Gettysburg, india, J.E.B. Stuart, John Gibbon, Kentucky, Manassas, OSS, Richmond, Robert E. Lee, Robert McCook, Sabine Pass, SAS, Sioux, Stephen Crane, Stonewall Jackson, Tern, Texas, the battle of gettysburg, the civil war, the confederates, The Red Badge of Courage, Tory, Ulysses S. Grant, Union, WIN.